There was never going to be anything conventional about New Islington. Already the social housing at Islington Square is included on architecture tours. Now they’ll have to add Chips, too, says Len Grant. It’s been a long time coming. In fact, just over three years since I photographed workers preparing to dig the basement car park. But with water on three sides, it’s been a complex project. One construction manager apparently commented, “Normally you’d build the castle first, and then the moat!” Here the ‘moat’ was ready-made. ‘Three fat chips on a plate’ is how the building was originally described and that’s just what it looks like. 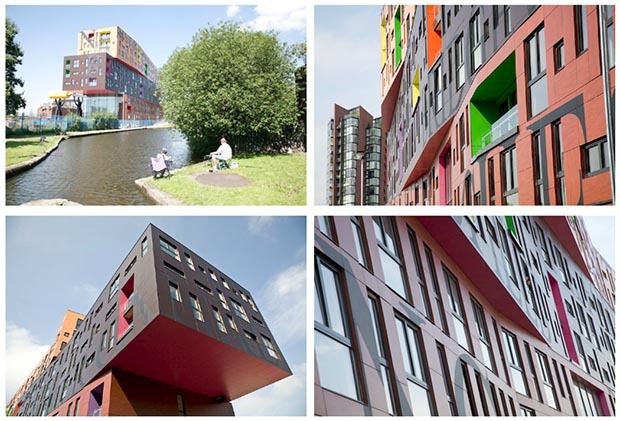 There’s nothing ‘blocky’ about this apartment block. 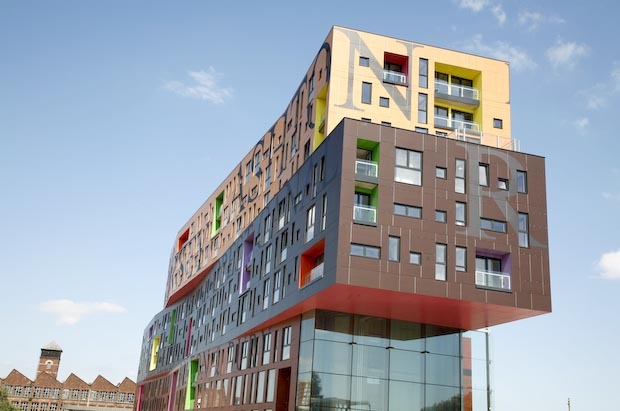 It’s the first residential building in the UK that architect Will Alsop has completed and the first opportunity for city living pioneers to buy into New Islington. Less than half a dozen of the 142 apartments are unsold and already, with still a handful of yellow-vested workers on site, some apartments are occupied. Fifty apartments have been sold to Manchester Methodist Housing Association, the social landlord for New Islington and one of the partners in this Millennium Community Programme. There are shared equity schemes and ‘try before you buy’ plans, which means you rent for a while before you put your money on the table. 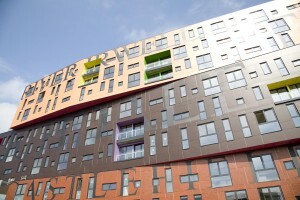 I’ve been around Chips several times whilst it was being built but today my tour guide is Urban Splash’s Chris Stalker. “We always wanted a feature here,” he says, as he leads me into the foyer. 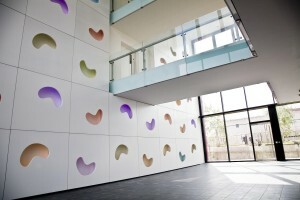 “This is what we call the ‘jelly bean wall’.” Dozens of jelly bean-shaped recesses dissolve from one bright colour to another. Subtle, effective and very photogenic. We take the lift. The views from the top floors are impressive, looking over the new park, (now called Cotton Field), towards the renovated Ancoats mills. I can imagine in 10 years all the cleared land will be occupied with buildings as adventurous as Chips, and you won’t be able to move for architecture tourists! It’s true. You can see all the elements coming together: the tram, the canals, the new park, the health centre, and all against the city centre backdrop. Not that much is coming out of the ground at the moment – not even New Islington is immune from the ‘crunch’ – but when things do start rolling again, Chips will have been just the starter. Chris leaves me to wander around the outside of the building and I try to take in all the names of canals and rivers that wrap around the cladding, supposedly like newsprint. Cheshire Ring, Bolton and Bury, Bridgewater, Ashton, Mersey, Rochdale. Are these all the waterways you can reach from here? Maybe so. Soon brightly-painted boats will be mooring alongside the newly-created canal arms, their crew enjoying a pint (and a packet of salt ‘n’ vinegar) at Chips’ restaurant/bar. Not long now.